As entry level jobs are harder to find and living independently becomes more expensive, recent graduates are moving back home in greater numbers. 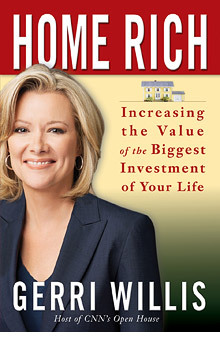 For more information on managing your largest investment, check out Gerri Willis' 'Home Rich,' now in bookstores. NEW YORK (CNNMoney.com) -- They've been dubbed boomerang kids and a recent poll by collegegrad.com shows that 80% of 2009 college graduates moved back in with their parents. That's up quite a bit from recent years. So whether kids are home for just an extended summer or until they find a job, its important to set up some guidelines before they settle in. Consider drawing up a written agreement between you and your child. Outline a time frame as well as responsibilities, both financial and around the house. Some parents charge rent while others won't even consider the idea. Whichever you choose, make sure to make clear exactly what the child is responsible for when it comes to other expenses like groceries. Keep credit cards and cell phones separate. Johnny can pay for that himself. These are financial responsibilities your child needs to learn to take on. But do consider keeping your child on your health insurance plan. If your health plan is employer-based it probably offers lower premiums than individual health insurance. Twenty-five states give graduates the option to be covered under their parent's policy, but state laws vary, so the age cutoff could be 24, 25 or 26. New Jersey has the highest age limit at 30. Check out the Kaiser Family foundations Web site at statehealthfactsonline.org to learn about your state's rules. The reality is, if your child is too old to qualify, you'll need to find individual health insurance and decide who will pay for it. Don't forget about auto insurance either. If your child plans on driving the family car, your payments will go up. So figure out who is going to pay what. The bottom line is, you don't want to risk your own financial health. You shouldn't feel like you're on the hook for things you used to pay for when your child was younger. Food and shelter for one extra person costs thousands of dollars each year. So laying everything out on the table ahead of time and establishing a plan of action is key. Got a financial dilemma? Go to CNNMoney.com/helpdesk to submit questions, read the Help Desk articles and check out new Help Desk videos. And tune in to CNN's Newsroom Tuesdays and Fridays, when Gerri Willis and other experts answer your questions.